One could be forgiven for doubting that physics is an empirical science when viewing it through the prism of quantum mechanics, the branch of physics that deals with the properties of atoms and molecules and how they interact with light. The seemingly counterintuitive concepts used to understand quantum mechanics were introduced to account for experimental observations that could not otherwise be understood. The theory developed by the founding fathers (and a few mothers) of quantum mechanics indicated that one could calculate the probability of finding an electron in an atom at a particular location, but not its exact position. This suggested that the theory might be incomplete, and in 1964 the theoretical physicist John Bell described an experimental test that could determine whether or not any "hidden variables" could remove the dependence on probabilities. For example, two electrons can be so close to each other that their quantum probabilities become entangled, and if care is taken, this entanglement can persist even when the two electrons are then separated by a great distance. In this case, a measurement on one electron can be transmitted to the other through their entangled probabilities, and Bell proposed a clever scheme by which one could verify whether such "spooky action at a distance" (as Albert Einstein dismissively described it) was real. Bell's theorem was ignored by most physicists at the time, as the majority of post-World War II scientists had adopted a more pragmatic approach to the quantum physics. Questions of meaning and interpretation were denigrated as "philosophy," while postwar physicists delved into the challenging problems of applying this theory to a wide range of fields, from nuclear physics to the development of the laser, transistors, and diodes. Nevertheless, in the 1960s and 1970s, a small group of physicists took up the question of the "meaning" of quantum theory. They formed the Fundamental Fysiks Group [sic], which met weekly at Lawrence Livermore Lab beginning in May 1975 to discuss Bell's work and interpretations of quantum mechanics, and it is their story, more or less, that David Kaiser tells in How the Hippies Saved Physics. This is a well-written and entertaining book that does an excellent job of explaining for the layperson the fundamental ideas of quantum mechanics. The physicists that formed the core of the Fundamental Fysiks Group could probably indeed be termed hippies, for in addition to their fascination with such real science questions as Bell's theorem and entangled quantum states, this group indulged in drug use, extended stays at the Esalen Institute in Big Sur, California, and investigations of para-psychological phenomena, such as ESP and Uri Geller's "spoon bending." 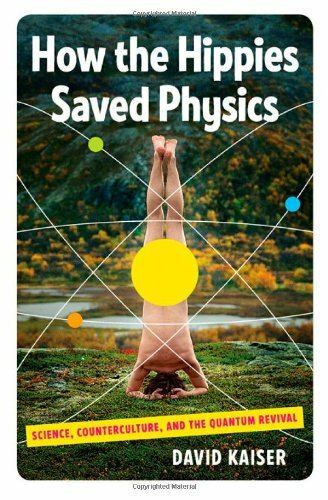 However, they could not, under any circumstances, be credited with "saving physics." Bell's work was noticed by the experimental physicist John Clauser back in the 1960s, and Clauser would go on to conduct the first experimental test of Bell's theorem, for which he shared the 2010 Wolf Prize (Israel's rough equivalent of the Nobel Prize). While Clauser interacted with some of the members of the Fundamental Fysiks Group, his work proceeded independent of these "hippies." It is certainly true that the papers and lectures of the Fundamental Fysiks Group helped spur and motivate research. A paper by Nick Herbert, one of this group, suggested a scheme by which entangled quantum states could be used to transmit signals faster than the speed of light. While Herbert's proposal was eventually found to be incorrect, it was a valid contribution to the field, for in showing that faster than light could not proceed from entanglement, the important "no-cloning of quantum states" theorem was proved, which is the foundation of modern quantum encryption technology. It is certainly true, as Kaiser writes, citing John Bell, that "good scientists should […] keep an open mind," but one must take care to not have so open a mind that one's brains spill out! As Kaiser states, "[the] Fundamental Fysiks Group's dogged efforts to meld quantum entanglement with parapsychology and Eastern mysticism set the group's members apart from the physics mainstream." They were indeed outsiders, and their main contribution to physics was in their role as gadflies—with one exception. They did manage a rather innovative scheme to fund their efforts to deconstruct quantum theory. Some of this colorful group were supported by the Central Intelligence Agency, the "Defense Intelligence Agency and other branches of the Pentagon," who were interested in whether quantum mechanics could provide scientific validity to claims of ESP and remote viewing as legitimate tools for espionage. The members of the Fundamental Fysiks Group deserve credit for struggling to comprehend quantum theory when such efforts were unfashionable in physics. As the famous American physicist Richard Feynman said, "No one understands quantum mechanics." And yet, one of the most amazing aspects of this field is that you can use its results correctly and productively—even if you are confused by it. Good thing, too, for quantum mechanics is the foundation of solid state and semiconductor physics, the applications of which have come to define much of contemporary life, from cell phones to laptop computers to DVDs. James Kakalios is professor of physics at the University of Minnesota. He is the author of The Amazing Story of Quantum Mechanics (Gotham Books).